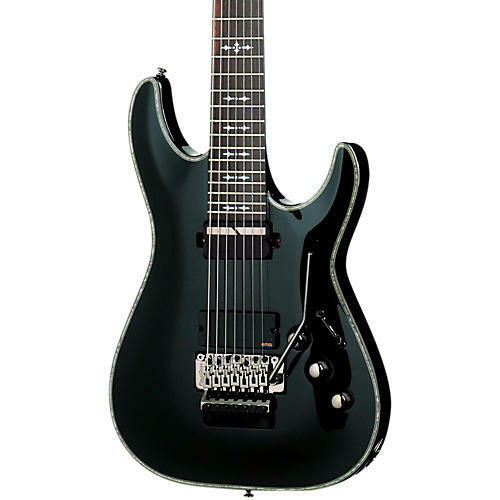 With seven strings and a long 26-1/2" scale length, the Schecter Hellraiser C-7 with Floyd Rose Sustaniac Electric Guitar is made to play heavy rock and metal music. 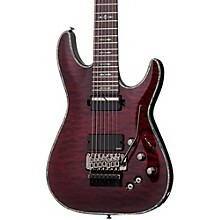 Other heavy-rock essentials found on this beast include a set-neck with 24 extra-jumbo frets, solid mahogany body with quilted maple top (black cherry), EMG Active 81-7/Sustainiac active humbuckers with dual mini switches, and a Floyd Rose 1000 series tremolo bridge with a locking nut. You will never be happy with just six strings again after you experience the low end growl of the C-7 Sustainiac. Bridge:The 81 is at its best for high volume overdrive and amps giving it a razor sharp attack, and incredible sustain for brilliant soloing. Sustainiac: This Driver/Pickup produces beautiful Humbucker tones when Sustain switch is off, and works as the Sustainiac Driver when switched On. The Sustainiac Driver creates an infinite feedback sustain of string vibrations by electromagnetic feedback.